New Delhi, Nov 27 (Punjab Mail) -Prime Minister Narendra Modi and Congress president Sonia Gandhi held an unprecedented meeting on Friday to find common ground on various issues before Parliament, brightening the prospects of the long-awaited GST bill going through this winter session. They sat over tea for 45 minutes at the PM’s residence in across-the-table negotiations on the crucial reform legislation, pending in Parliament since 2011. 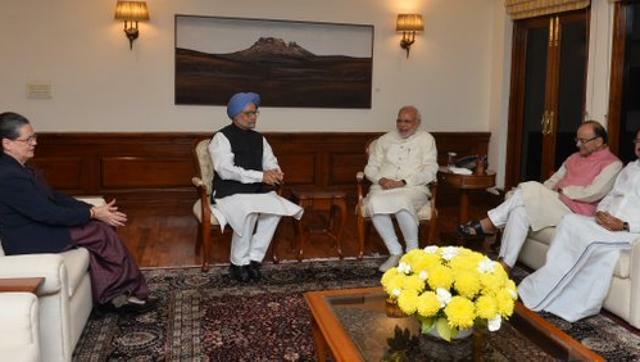 An hour before the meeting, Modi pulled out all stops to woo the principal opposition party. He praised the country’s first Prime Minister, Jawaharlal Nehru, in the Lok Sabha, declared that he wants Parliament to run on consensus, acknowledged the contributions of “all PMs and all previous governments” and repeated a BR Ambedkar comment that the Congress chief had read out on Thursday. Former PM Manmohan Singh, finance minister Arun Jaitley and parliamentary affairs minister Venkaiah Naidu were also present in the meeting. Gandhi, according to sources, appreciated the government’s move to talk with the Opposition and underlined the Congress’s three key demands on the GST bill. Jaitley explained the government’s position and is believed to have told Gandhi about the possible consequences of accepting the Congress’s demands. 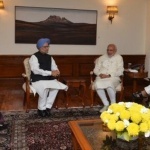 Manmohan Singh briefly intervened during the discussions, said sources. “We discussed matters related to the winter session. There was also discussion on the GST Bill. Congress leaders gave their suggestions, we also told them our opinion,” Jaitley said.